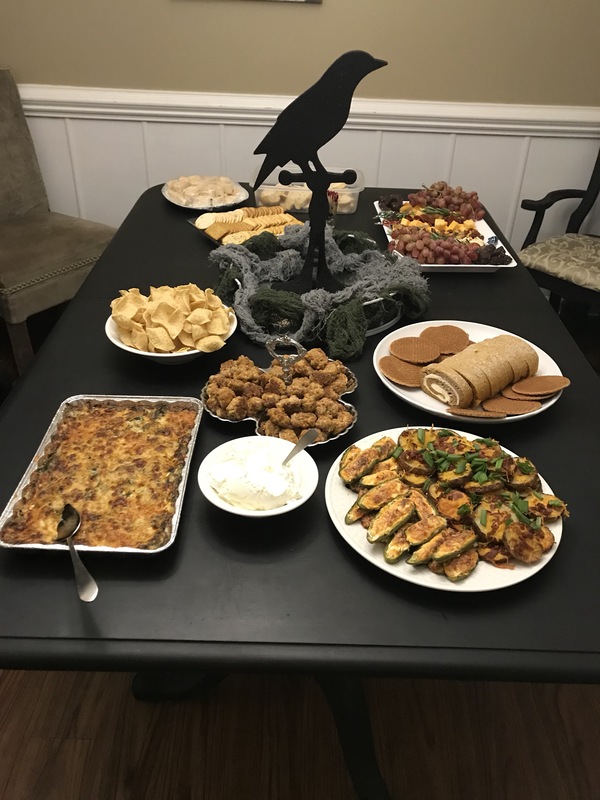 Yesterday, Trev and I hosted our annual Halloween party, and even though things were much more relaxed this year, the food was still amazing. We had homemade jalapeño poppers, potato skins, a lovely cheeseboard, sausage balls, and a few other snacks, but my spinach artichoke dip was definitely the belle of the ball. Everyone asked for the recipe so that’s what I’m sharing today. Let me start by saying, there are a million ways to make spinach artichoke dip, and they’re all basically the same. I didn’t reinvent the wheel with this recipe, but it does have a secret ingredient that really kicks up the flavor. One thing I love about this recipe is that it can be mixed up a few days before your event and refrigerated until the day of, so that all you have to do on your event day is pop it in the oven. The dip was gobbled up so fast I didn’t get a chance to get any great pictures of it, but here it is front left, in a really classy foil pan. (I said our shindig was low key this year… don’t judge). In a large microwave safe bowl, combine your onion and garlic and microwave on high for 1 min 30 sec, to get them slightly softened. Next add the spinach, artichoke, cream cheese, and Alouette and microwave on high for 40 sec or until cheeses are softened. Remove from microwave and stir thoroughly. Add kosher salt, Texas Pete, mozzarella, and stir again. Next, spread your dip into a prepared baking dish (I like to use a 13×9 pan, so it gets bubbly and browned faster, but you could use an 8×8 if you need to). Top with Parmesan cheese and bake at 425 degrees for 25 min, or until the top is browned. You can also cover it, before baking and refrigerate for up to 3 days. I like to serve this with tortilla chips and baguette slices, but crackers work great too. I hope you enjoy this one! Let me know if you try it!